Philia is one of the Greek words for love. Specifically it refers to love between between family or friends. I don’t know about you, but we could definitely use a little more philia around our home sometimes, especially between my older two! What better time for the Family Philia Challenge than Valentine’s Day?! For the week leading up to Valentine’s Day (or a longer or shorter time if you prefer), challenge your family to go beyond the norm and show a little extra love for each other. Choose one of these activities to do each day. You can get a printable here. You can let the kids choose which activities they want to do. This is a great way have them contemplate what they enjoy doing together or what they are will to do for each other. For those who enjoy the element of surprise, you can list the activities on pieces of paper and draw an activity each day. 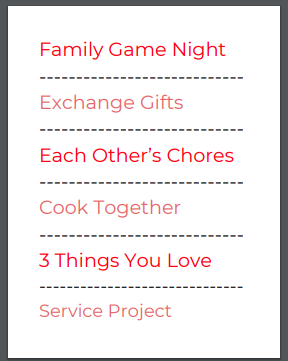 If you have lots of things scheduled, you can pick and choose the activities for your family to complete. After all, you know them best! Exchange Gifts–If you have the extra dough, challenge them to really think about what other family members. This can just as easily be done at the Dollar Tree. Frugal is our friend! Do Each Other’s Chores–Let the kids pick one of their siblings chores to do for them as a way of taking the load off of them. This is when it becomes an act of love. If you tell them which chore they will do, it’s no longer a way of showing love, just a way of reassigning the chores. Cook Dinner Together or Fondue–Check this out for more family meal ideas. Name 3 Things that You Love About the Other Family Members–Give each family member a turn to share their 3 favorite things about the others. We don’t allow anyone to repeat the same thing so they really have to think about what they love. Give them a minute to think and ask for volunteers to go first. We don’t want anyone to act like they can’t think of anything and hurt feelings! Do a Service Project Together–Our love grows when we bond over helping others! Have a Family Photo Album Night–Pull out the old family photos of your gang having a good time together. Remembering the fun and love of the past makes hearts more susceptible to love in the present and future. No photo albums? No problem! Join the digital age and make a slideshow! Create a Family Art Project—Here are a few ideas to get your creative juices flowing. What a great way to remember this time in your lives. I’m partial to handprint art. They grow up WAY too quickly! Family Fun Night Out–Choose a place that you all enjoy going together and DOING something, not watching a movie. Perhaps bowling, putt putt golf, or a jump place? Get involved with kids as a participant, not just an observer. If you have the opportunity, why not make it a weekend getaway? Hug Attack!! !–Start this one early in the morning. All day long, make sure that each time you pass your loved ones, you stop for a brief second to give them a hug and a kiss and tell them you love them. You can offer up a quick prayer for them too. Even though God commands us to love, sometimes the hardest place to do that is right in our own families. We grow familiar and become complacent. We take advantage of the fact that we can be ourselves and everyone still has to love us, or at least tolerate us. We get off track. I want more for my family than that. Don’t you? I want my kids to be best friends. When the have left the nest, I want them to hang out and call each other. I want them to know that their siblings and their parents will always have their backs. It starts now. 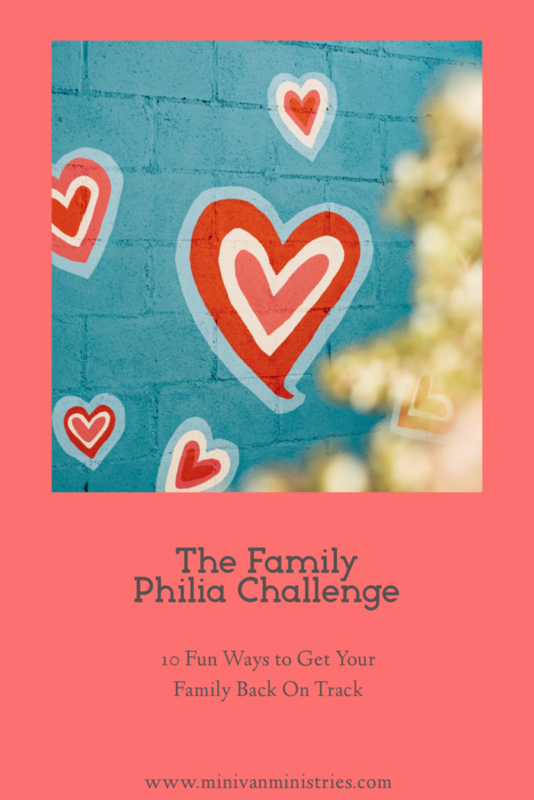 Take the Family Philia Challenge and get back on track. I’d love to hear how it goes! What are some ways that your family shows philia? I would love to hear how your family bonds!